Ajax Cape Town have been relegated from South Africa’s Premier League after the end of the season for fielding an ineligible player. 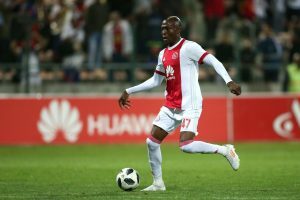 The South Africa Football Association (Safa) ruled that Ajax should forfeit three matches that Zimbabwean Tendai Ndoro appeared in. Ajax is the third club that Ndoro has played for this season, having also been with Orlando Pirates and Al Faisaly in Saudi Arabia, contrary to Fifa regulations. In response the South African club announced on social media that “is preparing papers to be filed urgently before the high court in Johannesburg for the matter to be heard tomorrow (Wednesday) morning at 10am. The Safa ruling means Ajax drop to 24 points as they lose the seven points they gained in three matches against Platinum Stars, Polokwane and SuperSport United. Platinum Stars originally finished bottom of the league but the points they gain from Ajax’s forfeiture lifts them to 27. In January Ndoro scored the final goal in Ajax’s 3-1 win over Platinum, a result that has been reversed to earn Platinum a reprieve. In the other matches Ajax originally drew 1-1 with Polokwane and beat SuperSport United 2-0. Platinum Stars now have the opportunity to contest in the promotion/relegation playoffs with Jomo Cosmos and Black Leopards, which start on Wednesday. Ajax have also been fined for a further four matches in which they have fielded Ndoro in. Ndoro himself has also been suspended for two games by Safa. The post Sanctions see Ajax Cape Town relegated after end of season appeared first on Citi Newsroom.